Sassy Buccaneer Pirate costume for women has a cute skull and crossbone printed skirt. 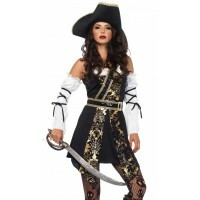 Deep burgundy and black pirate costume for women includes the high/low dress with velveteen lace up jacket detail, attached black skull printed sas and wide belt. The sleeves have fun bell cuffs. Hat and other items sold separately. Item Number: LA-c85209 | Approximate Size (Inches): 10.00 wide x 3.00 deep x 14.00 high | Approximate Shipping Weight: 2.00 lbs.